This new model is an upgrade on a similar version that launched last year. Upgrades on this particular model now allow it to track distances on up or down slopes. The Rangefinder can track with a measurement range of 4.5 – 550 meters and allows actual distances to be measured taking in to account the horizontal distance associated with the shot. Other features include the Golf Mode which displays a guide on how far you should hit the ball to the target. Other specs include a 6x monocular lens which has multilayer coating to help create bright and clear images. The information about the shot is displayed on the built in screen which shows the distance, incline or decline as well as the priority mode, as seen on the diagram below. Full specifications can be found over on the Nikon site. 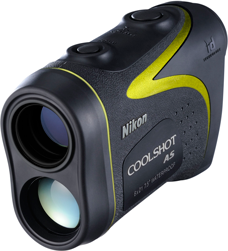 The COOLSHOT AS will be available soon although no specific release date is provided in the press release.